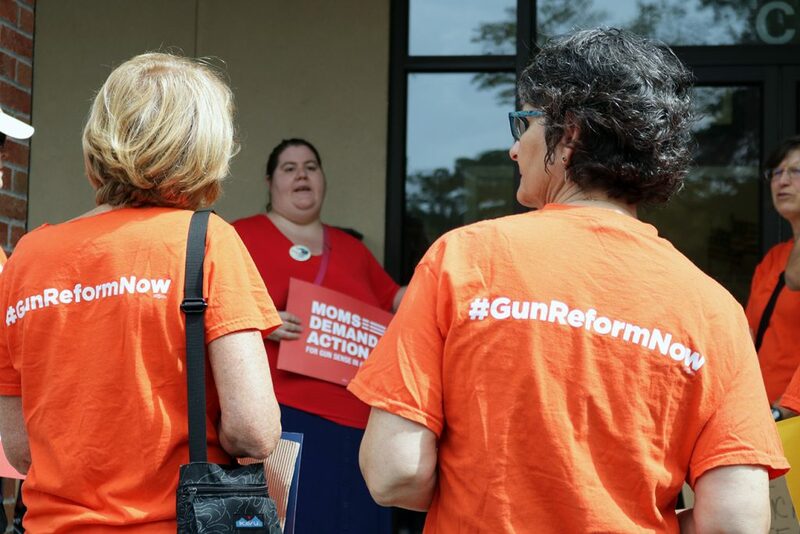 Protesters could be heard chanting “we demand change” outside of U.S. Rep. Ted Yoho’s office on Thursday, July 26, as students from March For Our Lives stopped in Gainesville on their Road to Change Florida bus tour aimed at educating young voters and ending gun violence. 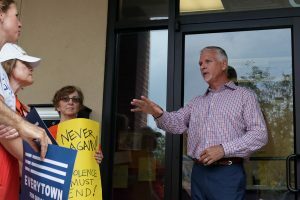 Starting at 11 a.m., organized protests took place simultaneously outside of the offices of state Sen. Keith Perry, state Rep. Chuck Clemons and U.S. Rep. Ted Yoho. The crowd’s energy grew as more protesters showed up, but before any chants could begin, Perry came outside to address the crowd himself. The students from the March For Our Lives group asked if they could join him inside to have a conversation and he allowed five of them in. 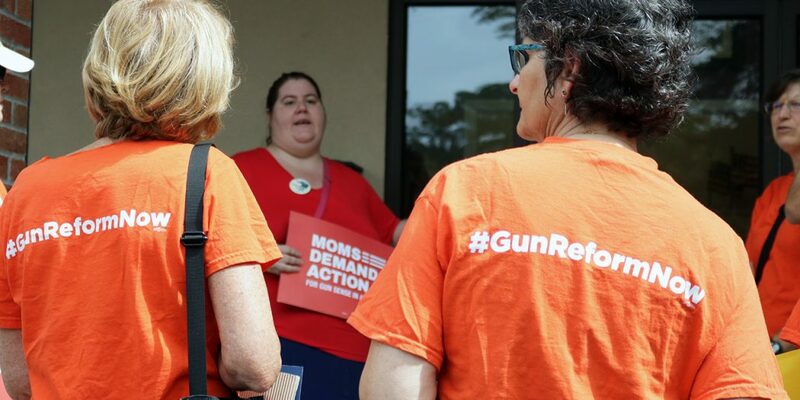 “They also have had serious inaction since their promises for gun reform after the Marjory Stoneman Douglas school shooting,” said Natalie Alatriste, manager of media relations for the March For Our Lives Florida tour, about the politicians that protesters addressed on Thursday. According to the March For Our Lives website, the goal with the Florida tour is to “register young people to vote and end gun violence.” They are visiting every congressional district to encourage political leaders to work toward that goal. “I’m here today to stand up to the politicians who aren’t doing the right thing,” said District 8 Senate candidate Dr. Olysha Magruder who attended the protest outside of Perry’s office. “I think it’s important for him to see that there are candidates running against him that are doing this,” said Magruder. After almost an hour, the students emerged from Perry’s office to a round of applause from the protesters. Perry was met with many questions. While he did not give any specific details about his stance on gun reform, he said the students gave him a list of ten points that he was going to look over and research. 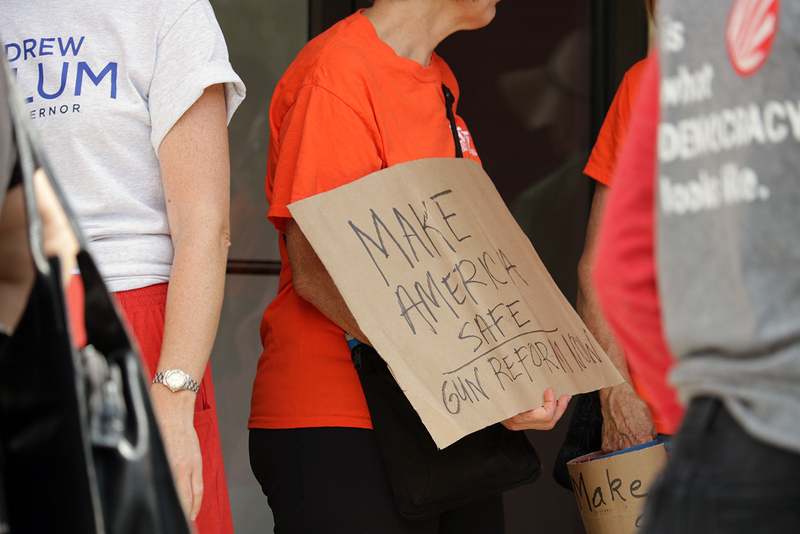 Over 1,000 people responded to the Facebook event set up by Jovanna Liuzzo, an Eastside High School senior, promoting the full day of activities in Gainesville revolving around educating and registering student voters while continuing the debate for gun reform. Survivors from the Parkland, Florida, school massacre announced in early June that they would be embarking on a two-month summer tour across the nation to call for more action on gun control and stage voter registration drives along the way. Their journey, with 50 planned stops in 20 states, began in Chicago on June 15 and will end in Newtown, Connecticut, on August 12. According to the March For Our Lives website, the separate Florida bus tour will visit all 27 Congressional Districts in Florida before August 1. 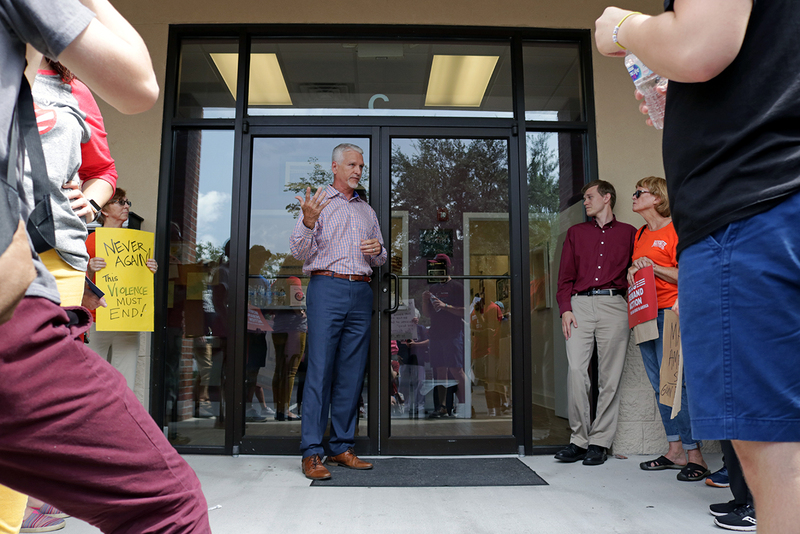 The two tours are scheduled to meet for the first time in Tallahassee for a “Rally in Tally” on Saturday, July 28. “We are really encouraged by the young people speaking out and we want to be here to support them,” said Veronica Donoso, a leader with Indivisible Gainesivlle. The local organization was created after the 2016 election and often supports other organizations that aim to help the community. “Enough is enough,” said Donoso. A Q&A with local students and those from Marjory Stoneman Douglas High School took place from 4 p.m. to 7 p.m. at the Gainsville Woman’s Club, 2809 W. University Ave.
Voter registration, meet and greets, food trucks and a t-shirt sale followed. The Alachua County Supervisor of Elections will have a booth throughout event to register and preregister citizens to vote, update registration and will have vote-by-mail forms available. Kaitlin is a reporter for WUFT News who can be reached by calling 352-392-6397 or emailing news@wuft.org. Hopefully politicians will be smart enough not to consider gun confiscation, or clamping down on the NRA, as any kind of solution. Gun free zones will only add to the problem, as 95% of shootings occurred in gun free zones, and none were committed by an NRA member. Focus on real issues, which includes mental health and discipline in the home. Stop the bullying.